The Russian President drew attention to Indo-Russian defence relations, which are no longer confined only to supplies of finished military hardware. Russian President Vladimir Putin has outlined his vision for increasing Russian arms exports to BRICS while participating in a regular session of the State Commission on Military –Technical Cooperation with foreign countries, a body in charge of policy-making in this vital area. 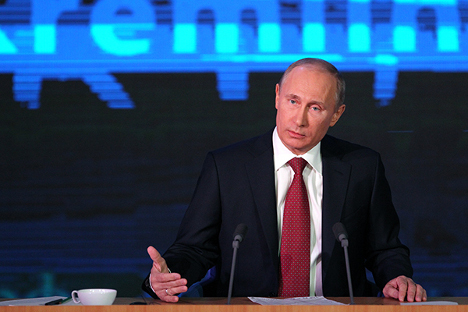 President Putin singled out the BRICS while speaking on Russia’s defence cooperation with foreign countries. Russia supplies armaments to 55 countries and ranks second in the world, next to US, in term of volume of arms exports. On the basis of new approaches and flexibility, we will develop military-technical cooperation with our BRICS partners – Brazil, India, China, and South Africa, said President Putin stressing that the political, economic and technological weight of these countries that account for 20 percent of global GDP and 43 percent population, are constantly growing in world affairs . Prospects for increasing defence cooperation with these countries is fairly bright as Russia maintains a close, constructive dialogue with them on host of important international issues. Highlighting that India and Russia are already key partners of Russia in this sphere, Putin sees huge potential for promoting military cooperation with Brazil and South Africa as well. Considering the growing technological, industrial and scientific potential of BRICS countries, Russia has to elevate military- technical cooperation with these states to a qualitatively new level, the Russian leader urged. In this context, Russia plans to pursue a policy that would include deep production cooperation, joint research and development, the creation of an effective service and an after-sale service system and the joint export to third countries. As an example of this kind of cooperation, President Putin drew attention to Indo-Russian defence relations, which are no longer confined only to supplies of finished military hardware. The Russian leader eloquently spoke about the growing component of R&D (Research and Development), licensed production and joint export to third countries in the bilateral defence cooperation. President Putin argued in favour of such production cooperation since it reduces cost of production, helps in getting new technology and transfer technology from the military to the civilian sphere. While Indo-Soviet defence cooperation was confined to Soviet supplies of military hardware to India making it a buyer-seller relationship, Indo-Russian military cooperation has gradually entered to the domain of joint research, development and production. Production of supersonic missile BrahMos, multi-role fighter jets Sukhoi-30 MKI in India, development of multi-role transport aircraft and fifth generation aircraft are some of the successful examples of such productive cooperation. There are many such projects in the pipeline. All this has unmistakably made India Moscow’s number one partner in military-technical cooperation, a strong pillar of Indo-Russian special and privileged strategic partnership. Putin’s Russia has pumped in billions of dollars to give a new lease of life to its military –industrial complex and strengthen Russian position in global arms market after the chaotic years of President Yeltsin that saw its steady decline. Russia is planning to invest more than 20 trillion roubles to revamp its defence industry and regain its past glory as a producer and exporter of modern military hardware. This year arms exports would fetch a record $14 billion for the Russian coffers, over-fulfilling the plan target. While Russia’s weapons sales have landed it in the second position accounting for one fourth of total global arms exports, the US is still firm in first place with a 30 percent share in the world arms market. Russia’s annual arms exports have more than doubled in recent years from $6 billion in 2005 to $13.2 billion in 2011. While Russia’s cumulative arms exports over these years have reached more that $44 billion, it has signed defence deals worth $15 billion in the current year. There are deals worth $43 billion in the Russian kitty for the next several years. Drawing attention to the importance of the post-sale and servicing system that includes the supply of spare parts, assistance in repair and modernisation, Putin called for serious improvement of the system. Already, certain enterprises of military industrial complex have received rights for export of spare parts, doing repairs and rendering services to the military hardware supplier earlier. As a result of such supplies and services, Russia received $2.5 billion last year alone. Russia is determined to provide a strong boost to its defence industry by creating new jobs, strengthening the material-technical base of production and bolstering massive research and development work and through the application of modern technology. 3 trillion rouble have been earmarked for the technical modernisation of the Russian defence industry in the coming few years. Perhaps, taking a dig at Beijing, President Putin in his speech drew attention to the issue of copying of Russian brands, widely practiced in China, and called for taking effective measures for protecting Russian intellectual property rights. Russian brands should be protected from illegal copying, he stressed. Strengthening civilized, good neighbourly and a mutually beneficial partnership in the sphere of military- technical cooperation is most important instrument for protecting Russia’s national interests abroad, Putin emphasised in his speech. While strengthening defence cooperation with traditional partners, Russia seeks to win new markets for its military products and services. Russian arms exports go to 55 countries in all continents.